We're just over a week away from Masters of the Universe on the big screen at The Egyptian Theatre where we'll be joined by several several members of the cast and crew. It's been a busy summer for the big Swede as Lundgren was recently in the news when photos from the Vancouver set of Kindergarten Cop 2 hit the web, Thor screenwriter Christopher Yost had been hired to take a crack at the MOTU reboot set up at Sony and passion project Skin Trade hit Blu-Ray shelves. But that's not all, folks. This past Labor Day weekend saw the El Rey Network playing the Rocky marathon on repeat hosted by Sylvester Stallone and Robert Rodriguez which means you got to see The Iron Man in all his 80's yoked and flat topped glory punching bags, killing Apollo Creed, training with high tech equipment, doing roids and fighting the Cold War against Rocky set to Vince DiCola's glorious synth soundtrack at least twice a day. 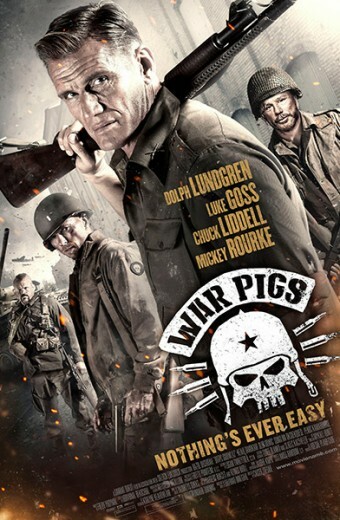 Tonight at the Hollywood Arclight, Dolph is expected to attend the premiere of War Pigs, the World War II action flick co-starring Luke Goss (Blade 2), former UFC champion Chuck Liddell and Expendables co-star Mickey Rourke. Ryan Little directs from a script by Adam Emerson, Andrew Kightlinger and Steven Luke. I'm a sucker for WWII men on a mission flick and a lot of love and work went into the project so here's hoping for an action packed and entertaining 90 minutes. Next week you can catch Dolph on the big screen three days in a row! On Thursday, 9.17, Warner Brothers premieres the long awaited documentary, Electric Boogaloo: The Wild, Untold Story of Cannon Films at the Landmark Theatre on the west side. Roger Corman, Lucinda Dickey, Mark Helfrich and the American Ninja himself, Michael Dudikoff are scheduled to attend for Q&A. 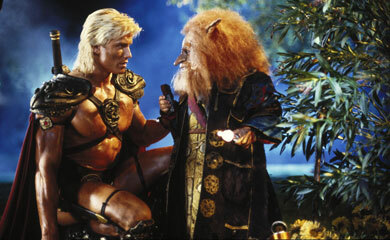 The following night, you can catch Cannon's mini-epic Masters of the Universe at The Egyptian with me while War Pigs hits select theaters the same night. 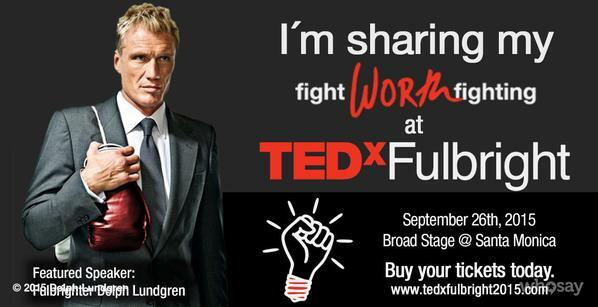 If that weren't enough Dolph for ya, the actor, karate expert, chemical engineer and filmmaker takes the stage for TEDx Fulbright Santa Monica to discuss Human Trafficking. This is an independently organized event to bring people together in TED like environments to spark discussion and connection. More information HERE and tickets over HERE. Phew, I'm tired just trying to keep up with him, see ya at the shows!